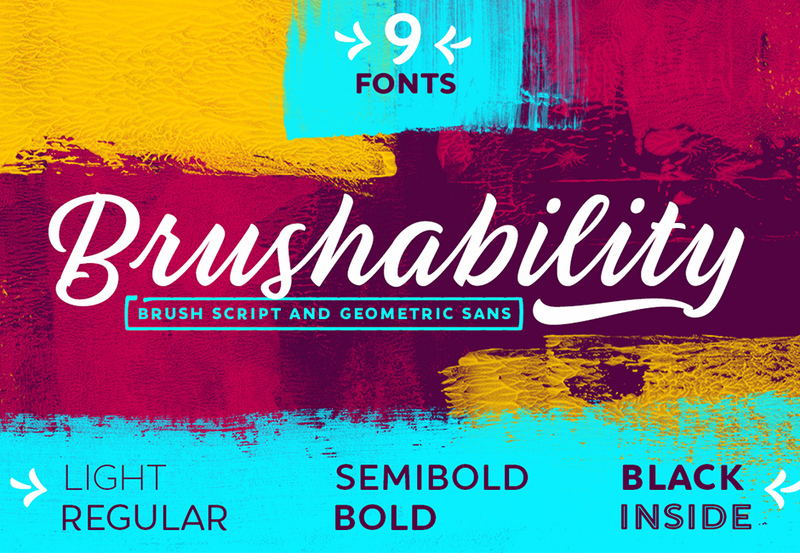 20 Phenomenal Font Families at 98% Off! This professional grade collection includes 220+ individual fonts, and 20 best-selling font families. These fonts set the bar in terms of quality, as we’ve teamed up with some of the top font foundries in the world! Featured are heavy-weight clean fonts, highly requested scripted fonts and gorgeous brush style fonts. 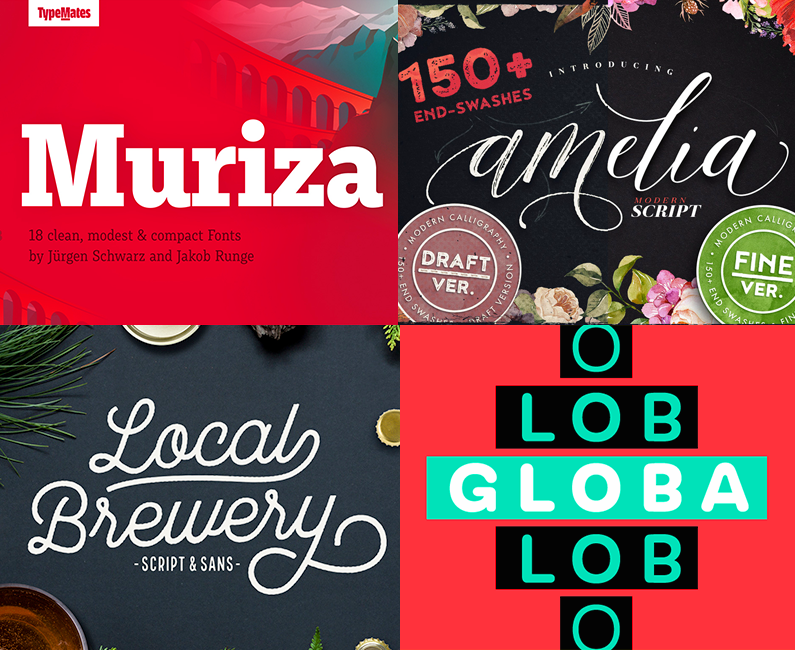 This bundle includes web fonts, and our extended license. You know that feeling when you’re working with a truly world class font? You’re full of inspiration to use it, and whatever project it touches, it seems to elevate the quality of your work. Designers know that the differences between a good font and a world class font can be subtle, but significant. What ultimately comes down to details such as kerning, x-heights and letter angles can put one font in a totally different league from another. At Design Cuts our mission is to bring you the very best fonts available online, at the most accessible price point. We’re so proud to be able to bring some of the biggest names in the font world to the Design Cuts community. The quality is phenomenal. Literally every font in this collection is a big hitter. These are seriously robust, professionally crafted font families, with incredible attention to detail. Many of the font families include dozens of weights, giving you ultimate creative flexibility. These fonts come with tons of stylistic alternates, ligatures and glyphs as well as our greatest language support yet. Every detail of every font has been carefully constructed and refined, with some fonts being up to a year in production. The variety of aesthetics in this collection is staggering, and it equips you for virtually any project. You will find big-name, corporate, clean fonts, best-selling brush fonts, and elegant scripted fonts. Whether you’re working on a logo design for a client, or creating some artistic merchandise for your own brand, this bundle can provide you with the perfect font. This bundle also includes our extended license, which is now updated to be more clear and flexible than ever before, as well as web font versions. Our hands-on support team is also here to assist with all your creative questions. You can see an overview of all the exceptional fonts in this collection below. We definitely recommend scrolling through the entire deal page to get the best idea of the quality and variety included. Styrian rooted and with a name dedicated to a region with soft rocks, forested mountains, narrow valleys and clear air, Muriza is a modest slab serif with tempting curves: Its clear and economic typography linked to peculiar shapes such as curved spurs instead of serifs combines well working normalcy with refreshing uniqueness. With a range of nine well graduated weights—from delicate Hairline to sturdy Black—and a conventional but distinctive italic Muriza can fulfil almost every typographic wish until it is related to a sober design. Furthermore OpenType layout features like oldstyle figures, small caps and stylistic alternates or dingbats and arrows are included as well as an extended language support with most Latin-based scripts supported. 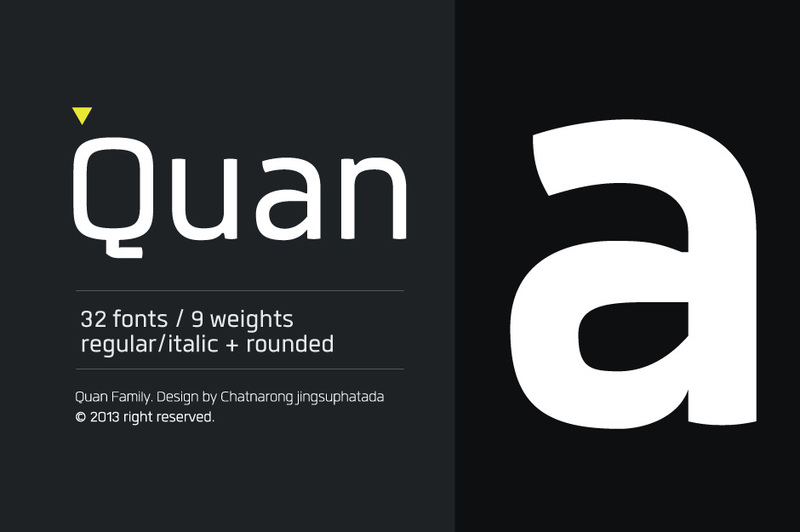 Qanelas Soft is a modern sans serif with a geometric touch. A friendlier version of the original Qanelas font family. It comes in 20 weights, 10 uprights and its matching italics. This font is designed with powerful opentype features in mind. Each weight includes alternate characters, fractions, extended language support (+ Cyrillic), arrows, ligatures and more. Perfectly suited for graphic design and any display use. It could easily work for web, signage, corporate as well as for editorial design. Alasar is a headline font family designed for magazines, newspapers, etc. It could easily work for signage, corporate as well as for editorial design. Includes four weights. Alasar comes in an OpenType format. Avaline is a super smart script font that is 100% handmade. 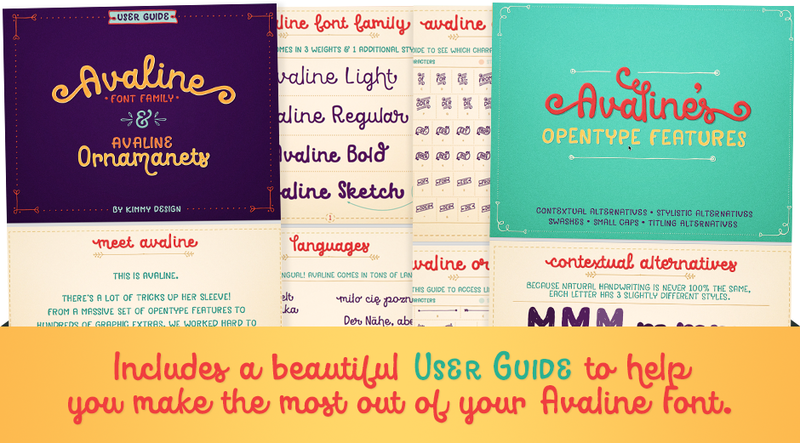 Its playful letterforms come in Light, Regular, Bold and one bonus style: Avaline Sketch. Each font has over 2,000 characters with loads of language support and a massive set of fun alternatives. • The imperfect hand-drawn style is utilized by using Contextual Alternatives – which gives each character 3 subtle variations as well as special styles that appear automatically based on where they appear in a line of text. • Stylistic Alternatives offer completely different styles for all capital and some lowercase letters. • Swashes provide numerous flourish options for ascending & descending letters as well as characters that start or end text lines. • Small caps and Titling Alternatives are great for secondary text options, converting the script letterforms to more uniform small caps. All of the above can be found within the catchwords, and extras/ornaments font files. Handcrafted by Lettering Inc as part of its core library of typefaces in the 1930s, Directors Gothic was dramatically expanded throughout the lifetime of the company and remains a timeless classic. Inspired by the Art Deco movement popular at the time of its creation, Directors Gothic was designed with an eye toward expanded utility for use in advertising headline and smart corporate materials. Directors Gothic was painstakingly developed from the original font glass masters from the 1930s and includes a full international character compliment, automatic fractionals, ordinals, and an impressively large assortment of alternate characters in dynamic OpenType format. Huzzah for Bookeyed Martin, the much anticipated addition to the popular Bookeyed family. Upright & strong, this font attracts eyes to its flashy serifs and ball terminals. Its handsome lines, created with an old-fashioned dip pen & sepia ink, reference vintage type in a modern quirky style. Bookeyed Martin is an OpenType font with juicy alternates, ligatures, roman numerals, 2 sets of arabic numbers and charming extra glyphs to pimp out your project. Looking for something fresh and tasty? Head on over to the Snackbar for an All-You-Can-Eat Script Font Buffet! Thinking about dessert? Go ahead and grab some Snackbar Tidbits! They’re sweet, satisfying slices of graphical goodness and make a perfect complement to our Snackbar family! When your tray is full head into one of our many dining areas all tastefully appointed in Snackbar Linoleum patterns perfect to dress up any design where a classic look is desired. You’ll delight in the variety of stimulating typeable patterns you’ll find, making your dining experience complete! After your meal don’t forget the doggie bag because you’ll have plenty of Snackbar Leftovers to take home. These tasty morsels will keep for months, always handy to jazz up your next home-cooked meal with hand chosen wordbats which go perfectly with our Snackbar fonts! We’ve taken all the guesswork out of your designs featuring an extensive character set including international support and a host of ligatures for smooth connections to make your work look hand-lettered! Get Snackbar today! A complete culinary adventure served up fresh by Squid and Sideshow. Local Brewery is a vintage inspired font duo that includes one script and one sans serif font. The script and sans serif are both hand-drawn with a rough edge. Local Brewery Script comes with lower case y, g and tail alternates included in the font’s glyphs. These alternates will give your designs an extra flair and uniqueness. Bonus Vector Alternates included as illustrator and .EPS files (CS4, CS5, CS6, CC). These vectors are identical to the extras included within the main font files. The script and sans serif fonts work exceptionally well together. Use Local Brewery for packaging, magazines, marketing, weddings, beer labels, film and clothing. Use in combination with each other to make awesome type designs for logos, posters, album covers, packaging, Instagram posts, etc. The script version includes 3 different sized end letter flourishes, access through the glyphs panel in your favourite design programs. Amelia Script is revolutionary new modern calligraphy typeface with more then 150 end-swashes that perfectly connects each single letter. It supports OpenType features. It is smart and it is working in Photoshop without necessary to open glyph panel! You are welcome to use it for various purposes: logo, wedding invitation, headings, signatures, T-shirt, letterhead, signage, labels, posters etc. • Apple Pages and Microsoft PowerPoint don’t support OpenType features, but you still can use alternates. Please see the help file for details. Introduce a little anarchy into your designs with the Sabotaged font set – not for the faint of heart! Hand-scratched with a custom made cola pen, this font set will tear through your text with unmistakable energy and raw power – perfect for logos, branding & product packaging, and any text which needs a heavy dose of hulk-mode. Sabotaged comes with a full set of upper and lower case characters, with some alternates & ligatures included – giving you the extra freedom to turn your text into authentic custom-made hand lettering. Also included is a bonus extras font, which consists of 26 hand-made ornaments designed to perfectly compliment your primary text. These range from swashes, circles and scratches to arrows, splatters and doodles – and are accessible simply by installing and selecting the separate ‘Sabotaged Extras’ font, then typing any a-z character. We’re not done yet though – I’ve also added a free additional font Violent Desire, which is the perfect companion when used as a supporting text for Sabotaged. • Sabotaged.otf: Includes a large range of glyphs including numerals, punctuation & multilingual support. Also includes ligatures and stylistic alternates for those who have opentype capable software (e.g. Photoshop/Illustrator). • Sabotaged Extras.otf: A set of 26 hand-made doodles, swashes, arrows, circles and paint splatters. • Violent Desire.otf: Includes upper-case only characters, numerals and basic punctuation only. • .TTF files are also included for each font. MB Empire is a font that has its roots in early 20th century design. It has a distinctly English feel with its style references to the classic Gill Sans. This font has a very traditional look whilst still maintaining its own modernist individuality. It comes in six weights with italics and has extended language support. With many OpenType features including old style & lining figures, automatic fractions and more, it’s a font family that will work for almost any application. Argon is a unique typeface with a sporty, modern, adventurous edge. Made for giving titles an extra punch, Argon packs a full set of capitals, numbers and punctuation. Be it gigs, sports events, logo designs or humble lost cat posters, Argon was made to bring impact. Each letter is a solved three line thick puzzle that took me many months to put together. I hope you enjoy the result. Globa is a low contrast round typeface that resembles American sign painting. The upper portion of the characters is bigger than the lower one, giving the font a more playful and friendly personality. Another remarkable feature is its hooked terminals in characters such as C, G or S, upping the differences between similar characters.The Globa Family is composed of 9 different weights ranging from Thin to Extra Black plus a full set of dingbats. Globa was designed by Pedro González, under the supervision of the Latinotype Team. The Hand is a hand-written font designed by Fanny Coulez and Julien Saurin from French foundry La Goupil Paris. We wanted to create the most generic, readable and balanced hand-written font yet. It’s in all-caps with 5 weights and alternates: All the uppercase letters are different from the lowercase letters. We also designed a regular dotted version so you can vary your effects. Vanilla Shot is a smooth script family with two weights and an ornament set. Vanilla Shot has its roots in commercial American sign painting of the 1950s and 1960s. Vanilla Shot has more than 1,000 glyphs per cut to help you create custom-looking headlines. Every standard letter has at least three alternates that you can access by turning on Swash, Stylistic or Titling Alternates in any OpenType savvy program or manually choose from alternate characters via the Glyph Palette. By turning on Small Caps you’ll find a frisky set of block letters designed to support the script or to be used on their own. Yorkshire is a beautiful brush script created with both pen & brush to give a great contrast between thick and thin curves. Drawn, scanned & vectorized from paper to screen. I wanted to create an authentic brush typeface leaving the texture and imperfections the way they really are. Yorkshire is perfect for scrapbooking, wedding invitations, labels, logos, apparel & much, much more. Introducing Hello Lucky! A cheeky little dry marker font, with an inky complimentary font, and oodles of marker-made decorative ornaments. Just type out your design, make it pop with the bonus font and extra scribbles, doodles and rushed underlines from the ornaments font. On its own, or with the extras – Hello Lucky is bound to make a statement. It has standard ligatures included to give the font a more natural, scripted look when you have any double letters in your design. It also has multilingual support with accented characters for international users. For folks who have OpenType capable software: The ligatures are accessible by turning on the ‘Standard Ligature’ button on in Photoshop’s Character panel, or via any software with a glyphs panel, e.g. Adobe Illustrator, Photoshop CC, Inkscape. I’ve also included a set of corresponding .TTF files. A Fortuitous Font Set : Hello Lucky Ink is a complimentary inked font, that works in harmony with Hello Lucky to create awesome typographical creations in a jiffy. • Hello LuckyOrnaments.otf – with 50 bonus decorative ornaments that will come in handy in your designs. • .TTF Files for the above-mentioned .OTF files. For the better part of 2015 I spent my type design time on Flabbergast, a didone for headlines with wide language support. After creating all of the design for my game Assumptions using didot, I felt inspired to create an even higher contrast font, for print and web. I set out only to make one weight (regular) but fell in love with even heavier verticals and added a bold weight. It was released in November of 2015 and the download includes .OTF files for the regular and bold weights, as well as webfont kits for each. 20 beautiful and professional, versatile fonts, perfect for adding further finesse and quality to your design work. There is a total of 222 fonts included in this bundle within the 20 font families. This deal includes extended licensing on all fonts, web fonts, and a handy .PDF browsing guide and image gallery for navigating your new items. 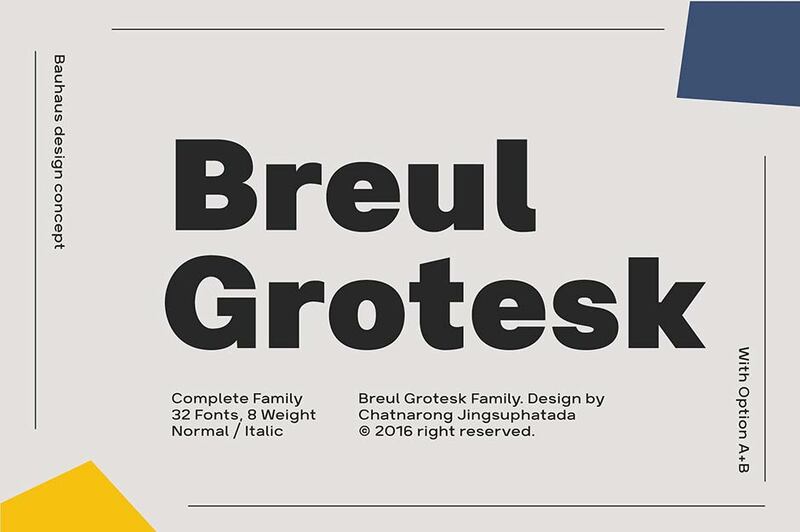 Deal includes 20 beautiful and professional, versatile fonts. All fonts include web versions. Deal includes our new extended license. Please see full license details here. We are now offering a ‘quick install’ file, to be found as a separate download. This allows you to install all fonts included in this bundle in just one step. I missed that deal and I checked out your marketplace to buy that fonts. Unfortunatly the fonts are not available there. Is this going to change? Thank you for getting in contact by leaving us a comment :). I am really sorry to hear that you have missed the expiry on this bundle. As we have recently launched our new marketplace, we will no longer be featuring our older bundles as re-runs in conjunction with our new bundles. I’m so sorry to disappoint you! If there are any other particular items from the Update on 20 Professional Grade Fonts that you were interested in that are not currently featured in our marketplace, please don’t hesitate to send me some links, and I’ll be sure to start working on securing the resources for you right away! I hope this helps and if you have any other questions or if there is ever anything else I could assist you with, please do get in touch. I’m always happy to help! I am really sorry to have to say that this deal is now well and truly finished I am afraid, so I won’t be able to set you up with this anymore! As we have recently launched our new marketplace, we will no longer be featuring our older bundles as re-runs in conjunction with our new bundles. I apologise for any disappointment caused! I am not sure if you are already aware of how our marketplace works Tobias, but I have popped you over an email with some more information in hope that this will help you. If there was ever anything I could assist you with please do get in touch :). I need this collection in my life!! I have sent you a quick email to assist you, I hope it helps! Thanks so much for reaching out to us! I am so sorry that you’ve just missed out on this one and it has now in fact completely expired, I am so sorry to disappoint you! As we have recently launched our new marketplace, we will no longer be featuring our older bundles as re-runs in conjunction with our new bundles. I’m so sorry to disappoint you! If you aren’t already aware Dinh, our marketplace will allow you to grab some of the most popular products from past bundles as a kind of second chance if you missed them the first time around, so rest assured there is still an option to purchase some of the most popular items from our past deals :). I hope this helps and If you have any other questions or if there is ever anything else I could assist you with, please do get in touch. What a delightful bundle of font families. Thanks to all developers for their generosity and flexibility, and for Design Cuts in just being awesome. Thank you so much for your kind words, MJ! I’m really pleased Carol was able to help you out 🙂 I really hope you’ll enjoy your new fonts and will get loads of use out of them. If you have any queries, please let us know. We’re always happy to help! What can I do to have this bundle? It is so awsome dupper plus blaster fantastic!! Impecable! It is hard to find good typography like yours!! Loved it! I have sent you a quick email to assist you with this, I hope it helps! I don’t know how this deal missed my inbox. I would have pounced on it like a hungry cheetah. Will it by any chance be coming around again? I was crushed after drooling over the bundle and seeing the Expired button at the end. Thanks for the comment and I am so sorry to hear that you missed out on this one! I definitely could not let the cheetah go hungry and leave you drooling! So if you check your inbox, I have just sent you an email which should help… :). I WANT! I NEED IT!! Thanks so much for your awesome feedback- we are so pleased to hear that you are loving this bundle :). I definitely couldn’t let you miss out on this one so I have sent you an email which should help! Is ti possible to get the this bundle???? I was out for a week and then the deal got over…. Pleeeeaaasee!!! Thanks for the comment! Oh no- I am so sorry you missed out on this one- this one finished up on Tuesday 15th March. However I couldn’t leave you stuck so I have just sent over an email which should help! Thanks so much for your comment! I am so sorry to hear that you were late and missed out on this one! We unfortunately wont be putting this one back on offer but I have sent you an email which should help you still pick this one up :). Argh! Well, that teaches me a lesson! This looked like a lovely bundle, I shouldn’t have put off purchasing it. Looking forward to your next ones, DC people; thank you for putting these together! Thanks for the awesome feedback on this one! The expiry date on the bundles tend to sneak up on you so I am sorry to hear that you missed out on this one! I have sent you over an email about the bundle Bob which should help if you still wanted to grab a copy :). We should also have another font bundle out in the next few weeks! Thanks for the comment! I am so sorry that you missed out on this one! Rest assured, we run a new deal every 2 weeks and the new deal will go live very soon after the old deal expires. At the moment we have a Vector bundle available until Tuesday 29th March :). Please do let me know if there are any resources that you are particularly after and i can work on sourcing them for you! I have sent you an email about the font deal though if you were still looking to get a copy :). I did notice that the font Qanelas Soft is actually Qanelas (not soft). Is there anywhere to download the soft version? Thanks for the comment on this one and we are so pleased to hear that you are enjoying your bundle! I am so sorry for the mistake with Qanelas- I can see from your account that you picked this bundle up on the day it was released. It initially went live with Qanelas but we realised the error and updated the bundle and account page that day. However it looks like you grabbed a copy before we changed it to Qanelas Soft so my apologies for the mistake Jerry! I have popped you over an email with a link to Qanelas Soft so you can get working with this straight away! I hope this helps, and please don’t hesitate to contact me should you have any other questions. I’m so sad to have missed this!! Thanks for the comment and I can definitely help you with this :). I am so sorry to hear you missed out on this one! With the launch of our marketplace we are no longer re- running our older bundles- instead our marketplace lets you grab the most popular items from our expired bundles so you still have a second chance to pick up any missed items from expired bundles! However I may be able to help with this one and have popped you an email :). I also missed out on this.. my laziness is to blame. What could I do to get the deal or something similar? Thanks so much for getting in touch, I’m really sorry to hear you missed out on this deal! Thanks for the comment and I hope you had fun with the poster tutorial! I am so sorry to hear that you missed out on this one- we unfortunately are unable to bring it back but I have popped you an email which should help out :). I have sent you an email to assist you with this, I hope it helps but please do let me know if you have any questions, I’m here to help! I’ve just sent you an email to help you with this one! I just went to purchase this deal since the tab has been open for a few days while I thought about it…and its EXPIRED 🙁 Can you help?? Thanks for the comment and I am so sorry to hear you missed out on this one- it expired on the 15 March so you unfortunately missed out by a few days! However I can still help you out and I have popped you an email about it :). NOOO! I can’t believe I missed this 🙁 I was planning on buying it but I didn’t see the email about it expiring. Do you think it might be reopened at any time in the future? I missed it too. I hope it comes back! I have just you an email to assist you, I hope it helps! Thank you for getting in touch, I am so sorry to hear that you just missed out on this bundle! I can certainly help you out with your query, you can find the 62 bonus styles for Boutique in the Complete download link in your account page. The Desktop & Quick Install folders only contain the font files. I apologise for any confusion caused. I hope this helps, Shruti, and please don’t hesitate to contact me should you have any other questions. I’m happy to help! Awesome bundle! Nice variety! I can’t wait to put these to use. Thank you! Thank you so much for your comment, Sara! I’m really pleased you’re enjoying the variety in this bundle. That is great news, I really hope you’ll get loads of use out of your new fonts 🙂 If you have any queries, please let me know. I am always happy to help! resisted for as long as possible, damn, you guys are good! Thank you so much for you kind words and for picking up this fonts bundle 🙂 I hope you enjoy the newest additions to your font collection! 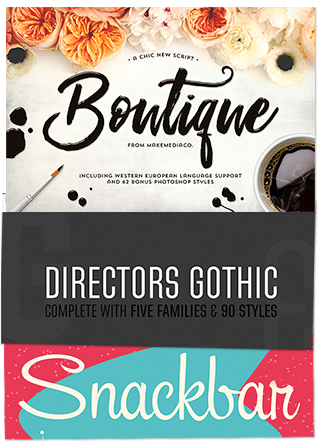 Another awesome deal from DesignCuts, Directors Gothic is the best. Thank you so much guys, you’re the best! Thanks again, Kris. If there is ever anything I could assist you with please do get in touch. I’m always happy to help! Hey, help please – do I need specific software to use these? I use inkcape or photoshop elements so don’t want to purchase to find I can’t use them all? Thanks for getting in touch, I can certainly help you out with your query! I’m happy to report that these fonts can be used in all types of text and design based programmes (including Inkscape & ELements) once they have been installed on to your computer. Happy Designing! If there is ever anything I could assist you with please do get in touch. I’m always happy to help. I like that font very much. I hope this helps, Serge, and please don’t hesitate to contact me should you have any other questions. I’m here to help! Another amazing bundle with even more clean fonts. Thank you so much for your comment! It’s great to hear you are enjoying the clean fonts in this bundle 🙂 Thank you so much for your purchase! It’s great to hear you are enjoying our new Quick Install feature as well, I hope this has made installing and organising your fonts an easier process for you. Thanks again, Nicolas! If there is ever anything I could assist you with please do get in touch. I’m always happy to help! I’m in love with these amazing fonts! Such a wonderful selection of really well crafted fonts. 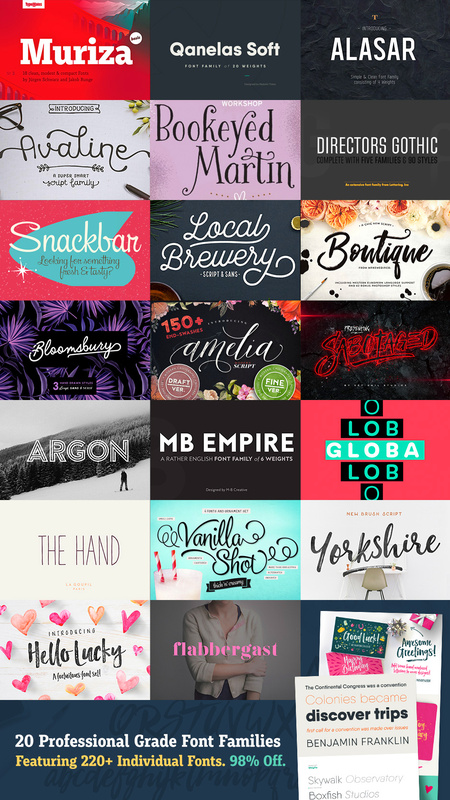 Excellent fonts for a wide array of different projects. Thank you so much for your incredibly kind words, I really appreciate you taking the time. If you ever have any questions or if there is ever anything I could assist you with please do get in touch. I’m always happy to lend hand. Finally something more than script fonts! That’s what I was waiting for 🙂 Thanks! The whole team & I really appreciate your kind words! Please don’t hesitate to contact me should there be anything I could assist you with. I’m always happy to lend a hand. I like that there is a great variety of styles, and full families which makes it much easier to actually use the fonts in projects. Thanks again for your kind words! If you ever have any questions or if there is ever anything I could assist you with please do get in touch. I’m always happy to help. Sold! This is a strong bundle, very nicely done! I appreciate that you guys included more clean fonts than usual. Thank you for getting in touch and thank you so much for your kind words! It’s great to hear you are enjoying the variety of fonts in this bundle. Thanks again, Nick! The whole team & I really appreciate it. You had me at Snackbar, you had my debit card at Vanilla Shot. If you ever have any questions or if there is ever anything I could assist you with please do get in touch. I’m always happy to help! I really hope you’ll enjoy your new fonts and will get loads of use out of them. I am always happy to help you if you ever have any queries! Thank again for your kind words, Marta. Happy designing and if you ever have any queries please do let me know, I am always here to help. Hi, the bundle is outstanding. I was wondering, what about the licence, can these be used for commercial use? Will definitely finalize the purchase later today! Thanks so much for the lovely comment Clelia! The good news is that yes, most of our bundles can definitely be used for commercial work. However, I would definitely recommend checking out our full license, to be sure that your specific projects are covered: https://www.designcuts.com/licensing/. I’m also popping you over a quick email just so that so you have the details to hand :). I hope that you’ll feel really inspired working with your new fonts, and if you need any help at all using them please do let me know. I’d also love to see any designs using your new fonts, so please do feel free to share any of your new creations :). Can I use the fonts for a temporary logo (Or permanent logo) for a client who plans to sell apparel (shirts) and other items like bumper stickers? I have sent you an email to get some more information from you and assist you with this. I hope it helps, and please don’t hesitate to contact me should you have any other questions. I’m here to help! I really love this font bundle. This will make the second one I’ve purchased from you guys. However … could you please confirm something for me? I’ve read your licensing FAQ on how the fonts can / cannot be used and I’m not clear on something. My question is: can I use these fonts on book covers (print format)? There’s mention about using the fonts with a POD source but I couldn’t understand what it meant. Can I use the fonts on book covers (print) using Createspace and IngramSpark? Thanks in advance for your answer! You should be okay to use your fonts within your book cover designs as long as they are completely flattened so that they cannot be used or extracted by any third parties. I have also sent you a quick email to go in to more detail about this and get some more information from you in order to give you a definitive answer! This is a frickin’ steal! Thanks Design Cuts. Thank you so much for your kind words, Mike 🙂 We really appreciate your support! Pardon me! Just forgot to rate the deal! Voilà! Great! Great! Grrreat! Empire and Flabbergast were just the fonts I was looking for! And what about Argon? Just gorgeous! It’s so great to hear that MB Empire & Flabbergast are just what you are looking for! I hope they make an excellent addition to your design projects 🙂 I completely agree, Argon is an awesome, bold typeface! I hope you enjoy using it too. Thanks again, Andrea. If you ever have any questions please do get in touch. I’m always happy to help! Addicted to the “BUY DEAL NOW” button every time I see a new bundle. Thanks again DC Team! If there is ever anything I could help you with please do get in touch. I’m always happy to lend a hand. Nice bundle again – but agree with the other comments about more clean and serifed fonts. The scripts are nice, but are getting tired/samey and (certainly in my own) day to day design are rarely needed…?! Also, not sure if it’s my eyes/screen, but the weighting on Flabbergast seems really uneven? I’ll still be buying though – Directors is great. Thank you so much for getting in touch with your feedback on our 20 Professional Grade Fonts, I really appreciate you taking the time. I’m sorry to hear that some of the script fonts in this bundle are starting to become repetitive for you. Rest assured, we’ve taken our community member’s comments on board and will be keeping our eyes peeled for more awesome, clean serif fonts. If there are any on your wish list currently that you would like to see in a future bundle or our marketplace please do no hesitate to get in touch with some links and I will be happy to reach out to the designers to see of we can feature them. I hope this helps, Benjamin, and thank you so much for your purchase! Please don’t hesitate to contact me should you have any questions. I am always happy to help. Thanks for your comment! I am really sorry but I’m afraid that the Extensive Mockup Templates Bundle is now well and with our new marketplace and with this in place, we will no longer be featuring our older bundles as re-runs in conjunction with our new bundles. I apologise for any inconvenience caused! If there are any other particular items from the mockup bundle you were interested in that are not currently featured in our marketplace, please don’t hesitate to send me some links, and I’ll be sure to get in touch with the designers to try and secure the resources for you! I hope this helps, Pen. If there is ever anything else I could assist you with please do get in touch. I’m always happy to help! Hi, I’m having a bit of a problem using the Avaline font in this bundle. When I began to run into difficulties I attempted to access the user guide which it says is included to see if that would tell me what I was doing wrong but, I can’t seem to find any user guide in my download. Help! can you aid me in finding out what is going wrong for me here? I think there is a mistake with names on PDF GUIDE. Tart Workshop developed “Bookeyed Martin Family”, but you mentioned Avaline Script Family + Bonus Extras which belongs to Kimmy-Design. Please update PDF GUIDE. BTW, both of these families are great! Thanks. Thank you so much for bringing the error in our pdf guides to our attention, I really appreciate you taking the time. We are on the case to correct this for you and the new pdf guide should be uploaded in the very near future, I apologise for any confusion caused. Thanks again for getting in touch about this, Dmitrii, I really appreciate it. If there is ever anything I could assist you with please do get in touch. I’m always happy to help! Thank you for getting in touch, I’m really sorry to hear that you are having an issue with Avaline. Rest assured, I am on the case! I have sent you a quick email to look in to this and help get you up and running again. I hope it helps, and please do let me know if you have any other questions. I’m always happy to help. I purchased this bundle and am loving it – I am however having some trouble finding the alternate type options on a couple of the fonts. For example, I’m not finding the alternative tails for the Local Brewery font. How do I access the alternate type options? Thanks for getting in touch and thank you for your purchase! I can certainly help you out with your query 🙂 I am sending you an email to get some more information from you and get you up and running with your new resources! Just curious: I’m new to creating design for myself and my partner. Currently, I use Canva as my designing platform. I was wondering – would the fonts in this bundle function on Canva? If not, what would be an alternative – photoshop? Or is there another easy-to-use designing platform for beginners you’d recommend? I hope it helps, Sara, and please don’t hesitate to contact me should you have any other questions. I’m here to help! Thanks for this great compilation! Really, awesome. Haha! Thanks for your comment, Nathan, and thank you so much for your purchase! I hope you enjoy the latest additions to your font collection, if you ever need any assistance at all please do get in touch, I’m here to help! Thank you so much for your kind words, Livia! This looks great! However I have one question: are the webfonts included? Thanks for getting in touch! I’m really pleased you were able to find the answer to your query 🙂 If you have any other questions or if there is ever anything I could assist you with please do get in touch. I’m always happy to help! This wonderful purchase brought a lovely ray of sunshine into an otherwise cloudy day — thank you so much. I am so happy to hear you are enjoying your purchase and i hope you get loads of use out of them! I already have a lot of fonts. Honestly, I don’t need anymore fonts, but darn, just love some of these so much…it’s a purchase for me. I know how you feel- we are true fontaholics over here- they are so hard to resist :). Thanks for your purchase- I know that the currency exchange isn’t great for you at the moment so we really appreciate your support! I hope you get loads of use out of your new fonts Joanne. Please do share anything new that you create as we would love to see what you are working on! Wow! I have just spotted Directors Gothic at another shop and the original typeface consists of an amazing 90 (!) individual fonts! Are all of these 90 contained in the bundle or is it just a selection? I believe they are all here in this bundle. Again, too much scripty stuff going on for my taste, but the clean fonts make this deal irresistable! Thanks! Thanks for commenting on this one and i am so sorry to hear you are not enjoying the scripted fonts in this one! We tried to get a nice mix of both artistic and more corporate styled fonts in this one so there is a little something for everyone. That is great news though that you are liking the clean fonts and I hope you get loads of use out of them! Amelia. Boutique. Hello Lucky. Bookeyed Martin. BUY! Thanks so much for the awesome feedback :). That is great to hear that a lot of the fonts made this an insta- buy for you1 Hopefully the extended license for the ones you already have will help as well! We would love to see anything you create using your new fonts Sonia so please do feel free to share anything you create! Ouch, another great deal and again my lamentations below. In fact I have only one remark about your deals composition – please compose deals with at least 2 typefaces with Cyrillic support. It could alternate with deals without Cyrillic at all. I will explain. Ruble is a very weak currency now, after oil price crunch and after Holy Putin attempt to convert Russia into big North Korea again. Ukraine have economic troubles too. Another Cyrillic countries not so rich (yeah, it is so typical for us). So $29 here in Great East-European Land of Pain is not the same thing that $29 for fellow designers from UK, US, BRD and so on. As for me, it’s a big deal to spent 29$ for a 1 useful font. This deal contains great Qanelas Soft by Radomir Tinkov. And again I’m not sure I will buy this deal only for 1 font. If I have 2 this fonts in 1 deal, I’m going to buy it, okay, for $15 each. Expensive again, but the world is not perfect and Cyrillic fonts are rare as f#ing diamonds. You made some deals with 2 Cyrillic fonts before. It’s a good practice as for me. Surely majority of your customers will have no problem with it, because all fonts with Cyrillic support have Latin support by default. “Sorry for your attention, dear friends”, as says one Russian political observer. Thank you so much for your comments on our current font bundle! Eviz- I am so sorry to hear that the currency exchange isn’t favourable for you- the USD is affecting a few of our Canadian community members as well but unfortunately this is out of our control. If we could change the rate in your favour- we most definitely would but hopefully this will improve for you soon! As Eviz mentioned, finding good quality Cyrillic fonts can be really hard so often we are unable to find 2 to put into our deal at the time of launch. As we receive requests for Cyrillic fonts in every deal, we would hate for other community members to miss out on any fonts with Cyrillic which is why there is often only one included. I promise we will continue to search for as many fonts with Cyrillic support as we can Eviz and Anton. As always, if you come across fonts with Cyrillic support, please do send me the link and i can work on getting them featured for you! I didn’t request you to improve exchange rates. I’m sorry, I can’t see any sense to speak about it. I really appreciate your client-oriented politeness, Carol, but I told about another things. I told about Designcuts deals composition. Unlike exhange rates this staff is under your control I hope. I can’t figure out what is the problem to move one font to one nearest deal and move another to the next one. Maybe you compose your deals in the night before publication? Ok, in this case its impossible. But I doubt you collect stuff by this way. But okay, “no” means “no”, mama said me so when I was a child. Maybe demand on Cyrillic so low and there is no reason to change your working process to meet this demand. Anyway, thank you for polite conversation. Thanks for coming back to me and I am so sorry for any confusion with my comment. I had mentioned the currency as you had advised that the Ruble was weak against the USD so my apologies if I misunderstood your original comment. I am so sorry if you thought my answer was negative in any way Eviz and rest assured I wasn’t saying no to your request at all- in fact i just wanted to be completely transparent with you and Anton about future Cyrillic support. As this language support can be quite difficult to find it is often the case that we only have one Cyrillic supported font available per font deal but we will continue to search for high quality Cyrillic supported fonts for your usage needs. I can assure you Eviz that we definitely don’t compose our deals the night before release- they are carefully curated to ensure there is a good mix of fonts in each one and that there is something for everyone’s needs. Unfortunately though it is not as simple as swapping fonts the way you have suggested- often some of our designers are unable to participate in certain bundles or certain fonts may be too similar to be used in the same bundle. I hope this helps Eviz and please do send me over any links of Cyrillic supported fonts that you come across that you would like us to try and feature for you. Hopefully we will be able to have a future font bundle with more than one Cyrillic supported font for you! Love your comment. I don’t need Cyrillic support at all ,for what I do, but just love how you explain your needs, and that grouping a few of the Cyrillic support fonts together, in one bundle, would work so much better for you. I hope that Design Cuts is able to meet your request in future bundles. I do understand the difficulties you bring up associated with currency exchange rates. Living in Canada, we too have been hit hard by declining dollar value due to oil price drops. Thanks for coming back to Eviz! I am sorry to hear that the CAD is still suffering at the moment! Rest assured we are constantly on the hunt for fonts with as much language support as possible for everyone in the community :). I couldn’t resist buying this! I LOVE your quick install file- what a time saver! Thank you! I really hope you’ll get loads of use out of your new fonts. If you have any queries, please let me know. I am always happy to lend a hand! This is the best mix of fonts E.V.E.R! 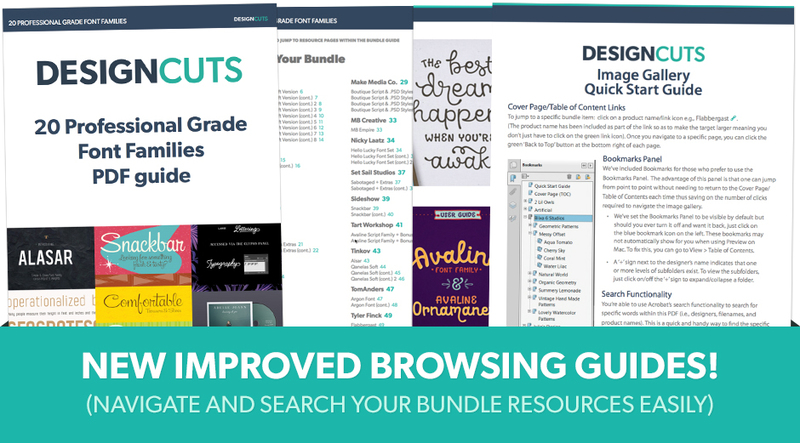 (And I know I’ve said this before for some other bundle, but that’s par for the course for DesignCuts bundles—just when you think they can’t get any better, they just leap clean over the bar again and again. 🙂 Thanks so much, DC Superheroes 😉 , for being the very best source of all the most awesome fonts (and more) in my arsenal! The whole team & I are so grateful for your support, Liv, and we hope to continue to lend a hand in keeping your creative toolkit stocked up with the latest & greatest resources! Best of your bundles so far! Bought. Thanks you for your purchase, I hope you enjoy using your new fonts! Oh my goodness! Wowee! What an incredible selection of fonts available in this bundle. If our dollar wasn’t so bad right now I’d be jumping on this asap! Oh well, maybe next time. Thanks for the comment! I really wish i could help you out with this but unfortunately Argon doesn’t have an ampersand! Hopefully one of your other fonts might help with the project but I am so sorry to disappoint you in this regard. Terrible…now I thought I WILL resist this next bundle to be able to pick 2 or 3 single fonts from the new marketplace. But I just can’t. The presentation of this font bundle is so outstanding, that I must have them ALL. And with these fantastic extras there is now way out. Sigh! Uh oh sorry to tempt you again with this bundle :). You are in good company and I am a self confessed fontaholic myself and must have ALL of the fonts! Thank you so much for your awesome feedback- we truly appreciate it! Directors Gothic!…that family pays for the bundle for me. So glad you are offering more than handcrafted fonts in this group. I’m in. PS: I agree with others who also want more pro serif fonts; esp. for long text blocks. That is great to hear you are enjoying Directors Gothic and we hope you get loads of use out of it! We are trying to include a good mix of both handcrafted and more professional fonts so Im pleased to hear this is working for you! If you have an Serif fonts that you would like for us to try and feature, please do send me a link to them and I work on featuring them for you! Hi Carol, what you have in this bundle with Muriza is a good start with a serif font that looks readable in long text. I’m a book designer and I lay out entire formatted pages of a book; not just the cover. So having beautiful, readable, and unique serif fonts would be a great addition to future bundles for me. Some fonts that I have been keeping an eye on but haven’t purchased are Pagewalker, Buozzi, Recia, and Manzello. But any modern styles that are easily readable in long text is great. I’m sure this offering would also be appreciated by designers of magazines, annual reports, corporate documents, and news. Great suggestions! I especially like Pagewalker, Recia and Manzello! Er – Have I just downloaded Quanelas Soft or is that Quanelas? – looks like the latter to me? Thanks for the comment and my sincere apologies about this! We had initially uploaded Qanelas in error but we realised this really quick and rectified this on the download! I can see from your account that you grabbed your bundle just after we went live with it Graham which is why you have the incorrect version. I have popped you an email with the proper link which should help you out :). My sincere apologies for this! Can hardly believe what I’m looking at. Amazing collection. Thanks so much for the comment! I had a ‘pinch me, I’m dreaming’ moment myself when Tom was showing the line up for this bundle! He really got a good combination in this one :). I hope you love working with your new fonts and please do feel free to share anything you create! You are so kind and thanks for the awesome comment! I hope you get loads of use out of your new fonts and I am loving your latest Insta post- never a truer word spoken :). When it’s a blind buy, it’s a blind buy! Another incredible bundle, big thanks to you and the team. Thanks for the IG love, always trying to drop value bombs, haha! Did not expect such an incredible font package so soon after the last incredible font package! Thanks for your lovely comment and we are so pleased that you are enjoying our font packages :). The weeks seem to be going by so quickly on us- The Font Lovers was released over 6 weeks ago although it feels like yesterday! This is a definite buy for me! So many amazing products in this one!!! Thanks so much for your awesome comment! We are so happy to hear that this was an instabuy :). Please do feel free to share anything you create as we would love to see what you create with your new fonts! What’s the difference between Muriza Basic offered here and the original Muriza? Thanks so much for the comment on this one! Hmm i have just checked this out and thank you so much for pointing this out! I am really pleased to say that this is the complete version of Muriza but we have just used the incorrect preview graphic so rest assured,you are getting the full 18 weights or Muriza :). We shall get this image fixed asap Jean! That doesn’t mean this isn’t a great font family as it is – powerful enough to do lots of great things with, but definitely does not seem to be the full version – but that costs £205.00 (+ VAT in UK) and I am not complaining at all with what we have got in this bundle. I have double checked this with the designer and Tom and there was a bit of confusion on our side so my sincere apologies for this. Usually when a font is listed as a basic version it means that it does not include all of the weights for the font family but this one does so we had initially checked the weights for this. however the designer has advised us that the basic version does not have the full listing of glyphs in the main version. My sincere apologies for the error here Jean and Graham and I hope you will still get loads of use out of your fonts! Thanks for the comment and I am so pleased that you like the look of this one! Unfortunately the currency exchange rate is something that is out of our control- if we could help with this, we most definitely would. Hopefully the rates for you will improve soon though! Great collection of fonts, though serif fonts are under-represented again. Maybe you are saving them up for the Great Serif Collection of 2016? Still, very, very tempting. I’m not sure I can resist. Thanks for the comment on this one and we are so pleased to hear you are tempted by this one! I am so sorry that there aren’t more serif fonts for you but we will keep working on this for you. If you do come across any serif fonts that you would love for us to try and feature, please do pop me over a link for them! Thanks for this awesome suggestion and rest assured, we are currently working on formatting a pdf copy of our licensing that will added to the Helpful Documents folder in your downloads. I apologise for any inconvenience caused! We wanted to get our licensing terms live on our website before adding them to our bundles but not to worry, we are working on implementing this soon. I hope this helps, Graham, and please don’t hesitate to contact me should you have any other questions. I am always happy to help! Arrrghhhh! You’re at it again! We certainly are, Chris! Thank you so much for your purchase! I hope you enjoy your new fonts. Every time I get a typography bundle from you guys, I tell myself, okay, this is it. This is enough. There is no reason for one human being to have this many fonts. No more. …Then I see the next one. Thanks guys for putting together such a well balanced and high quality selection of fonts! Thanks for your comment, I guess santa came very, VERY early for you this time around 🙂 haha! Thank you so much for your kind words & your support, the whole team & I really appreciate your support. Fun-tas-tic! Great deal! Thank You! Thank you so much for your kind words, Miki, and thank you for your purchase! I hope you enjoy your new fonts, if there is everything I can help you with please do let me know, I’m here to help! I officially had to add a section of my monthly budget specifically for these bundles. This one is so so good. SO good. Such an amazing mix of styles. Thank you!!!! Thanks for your lovely comment! I think it’s awesome that we feature in your monthly budget 🙂 Thank you so much for your kind words! Thank you for your purchase, I really hope you’ll enjoy your new resources and will get loads of use out of them. If you have any queries, please let me know. I am always happy to help! I’m so pleased you are enjoying the variety of this font pack, I hope they make a useful addition to your creative arsenal! Thanks again, Mandala. Please don’t hesitate to contact me should you have any questions. I am always happy to help. Thank you so much for your purchase, I hope you enjoy creating with your new fonts. If there is ever anything I could assist you with please do get in touch. I’m always happy to help! Thank you so much for getting in touch, it’s great to see you are loving this collection of fonts!